I can't believe how quickly the last month has flown by! That's the holidays for you, I suppose. We had a wonderful Christmas with my family and New Years with Mike's family (of course, I took zero pictures). And we were both off from work for the majority of those two weeks. Such a nice break from work!! And in the midst of all that, I hit 20 weeks ... we're more than halfway there! 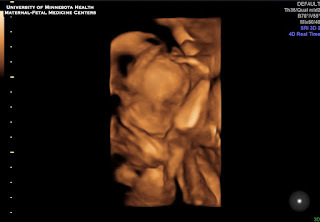 Last week we had a fetal echocardiogram which is standard for IVF patients. Basically, it was a 30 minute ultrasound focused only on the heart. Everything looked great. They didn't see anything abnormal. Love to hear that! 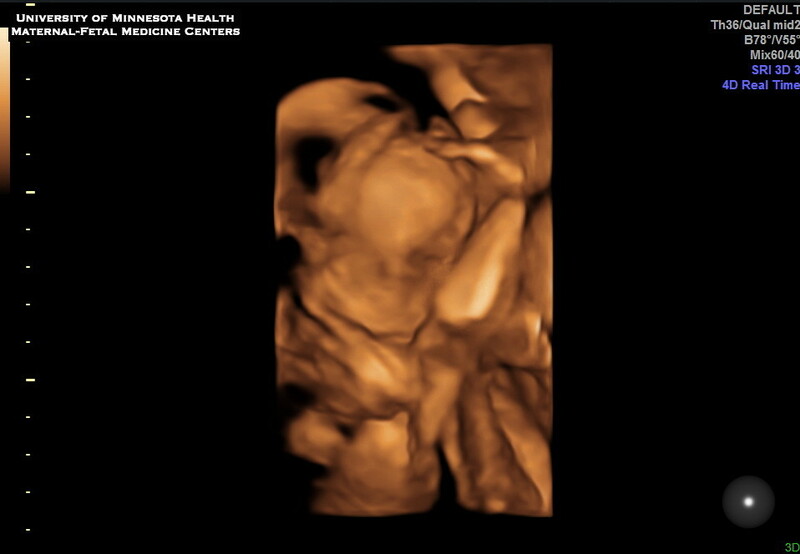 And love to see the baby, of course :) I'm thinking this could be our last ultrasound which makes me slightly sad. I will ask the doctor at my next appointment. The nurse only gave us two images ... both in 3D and one is technically a video. Baby had his feet up by his head ... so flexible! I'm finally starting to get more of a belly. And I'm feeling baby kick lots these days which is fun. Mike especially enjoys when the baby kicks me :-P I also think I might be having Braxton Hicks contractions (another question for the doctor!). Since around 18 weeks, from time to time I will feel a lot of pressure in my uterus and if I put my hand on my stomach, it feels like there is a hard rock in my abdomen. It usually relaxes after 15 or 20 seconds. At first I thought it was just baby moving around, but now that I've been reading about Braxton Hicks, I'm thinking that's what I'm feeling. Crazy! Don't make fun of my selfie skills! We are also in the midst of a remodel on our main floor bathroom. I'm so done with dust and contractors! But it will be worth it in the end ... I hope! Here are some before (goodbye, pink monster!) and during photos. This weekend I started my baby registries and can I just say that it is way more stressful than fun?! I am having to research every little thing. SO MANY CHOICES! Ugh. So here are my questions for all the moms who read this: what is the one baby item you couldn't live without and what did you hardly (or never!) use? First, YOU ARE ADORABLE and SUPER HOT pregnant!! Woot woot! A winning combination!! Second, so glad you had great holidays!! Third, wow!! The bathroom remodel is looking AWESOME! I love the new gray! And for the baby registry...try not to stress. Your baby will like what you give him. With Jason I got some of the Aden + Anais lightweight blankets--I didn't spring for them before--and they are a must. I used them to cover his infant seat from the sun, for swaddling, for wiping when I was out of burp cloths, for a nursing cover, and I still keep one in the car in case I need to shield him from the sun or as a light blanket. Leo and Jason never took pacifiers, so those were a waste, but Olivia used her's until three. You just can't tell. Wipe cases on every floor, in every diaper bag/purse, and in every car are convenient. Cloth diapers as burp cloths were my favorite and are still a staple in my house for wiping noses, putting under bottoms for changing diapers, etc. You can bleach them when they get gross, or at every wash! I used the bouncy chair a lot for the first 4-5 months. I used a wipe warmer for about a year, but it wasn't totally necessary. Thanks for all recommendations!! I've registered for some Aden + Anais sheets as well as some of stuff from the Target partnership with them (Aden). Hopefully, they will be just as soft as the real thing since I've heard great things! I haven't registered for bibs or a bouncy chair yet ... will get on it! Did you use the tiny drool bibs when they were little or just the larger bibs when they started solids? Any recommendations on baby carriers? Thinking of getting at least one. I loved my Baby Bjorn when they were very small up to one year, and I loved the Ergo for longer walks when they were over six months and up to two years. I used the little drool bibs for Olivia when I used a bottle. Not for nursing the boys. Then lots of bibs when I gave them solids from 4- ~14 months. Too many toys is easy to get... Your baby probably won't care about stuffed animals and rattles as much as you hope. I didn't use the travel high chair I had.